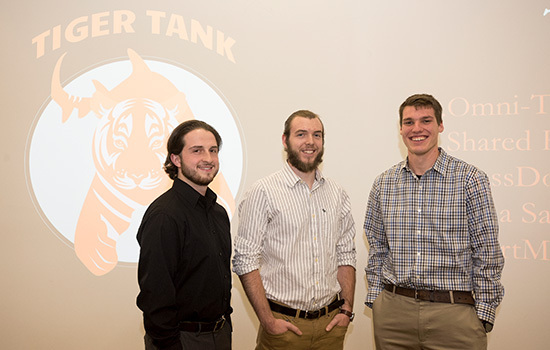 The RIT student team representing Omni-Temp was the grand prize winner of Tiger Tank. Pictured, from left to right, are Evan Pace, Andrew Pfeil and Mark Batorski. 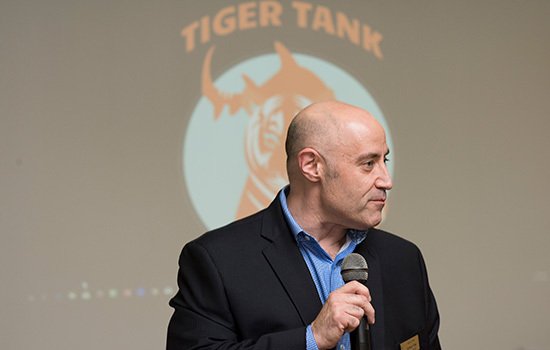 Five teams of student entrepreneurs at Rochester Institute of Technology pitched their business ideas to a panel of Rochester-area investors during the semi-annual Tiger Tank competition held in November, and challenged each other for cash, scholarships and the opportunity to launch their products or businesses. The top prize was awarded to the student team representing Omni-Temp, an app that regulates a vehicle’s temperature without running the engine. Omni-Temp is managed by Mark Batorski, a fifth-year electrical engineering student; Andrew Pfeil, a fifth-year electrical engineering student from Adams, N.Y.; and Evan Pace, a fourth-year finance student from Rochester, N.Y.
Omni-Temp is run by using a cell phone app that sets the vehicle to the desired temperature, notifying the user by text message. According to the team, benefits include reduced emissions and reduced wear on engine components. The system is also designed to sense an individual or pet in the vehicle, automatically activating the system to regulate the cabin to a habitable temperature and notifying the user. 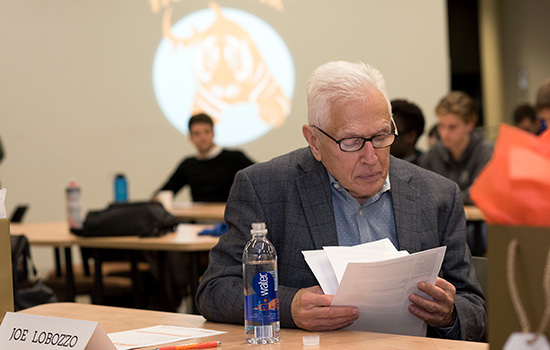 The Omni-Temp team received a $2,000 cash prize and a scholarship to attend one of the graduate programs in RIT’s Saunders College of Business. Aqua Salutem Technologies—uses sensor fusion to render a complete visual of a beach or pool environment for lifeguards. The system works by pinpointing in real time the depth and location of every swimmer in a body of water and graphically representing the information on a computer monitor. A network allows for rapid transmission of data, allowing lifeguards to quickly locate and rescue drowning swimmers. Aqua Salutem Technologies was founded by Maxim Zibitsker, a computer science and mathematics double major at Hobart and William Smith Colleges, in Geneva, N.Y.
Glassdorm is a platform where prospective college applicants can see what life is really like at colleges across the country. On the website, students can view everything from out-of-pocket expenses to dorm quality in “glassdoor-like” reviews from current and former students at that college. The platform also allows reviewers to supply information about their applications including high school GPA and SAT/ACT scores. Glassdorm was founded by Daniel Fisher, a fourth-year software engineering student from Dublin, Pa. Shared Hands—an on-call interpreter app automatically assigns available interpreters to requests made by deaf or hard-of-hearing individuals. Shared Hands was founded by Joan Bempong, a fifth-year computer engineering student from Irving, Texas, and David Stolze, a fifth-year industrial and systems engineering student from Rochester, N.Y.
SmartMove—consists of a compression suit and a mobile/desktop application. The suit evaluates athletic performance through sensor measurements. The application will display the front and back anatomy of a person and light up using heat map technology to show exertion level. SmartMove was founded by Brent Chase, a 2017 graduate of RIT’s biomedical engineering program, and was presented by James McGee, a fifth-year biomedical engineering student, and Kerri Zalba, a second-year software engineering student from Mentor, Ohio. Teams were required to present to the judges the problem the venture or business seeks to solve or gap in the marketplace it seeks to fill, a description of the target market, what value the venture would add to lives and potential challenges to delivering the product or service. Proposals were evaluated based upon their uniqueness, feasibility and the ability to impact people.